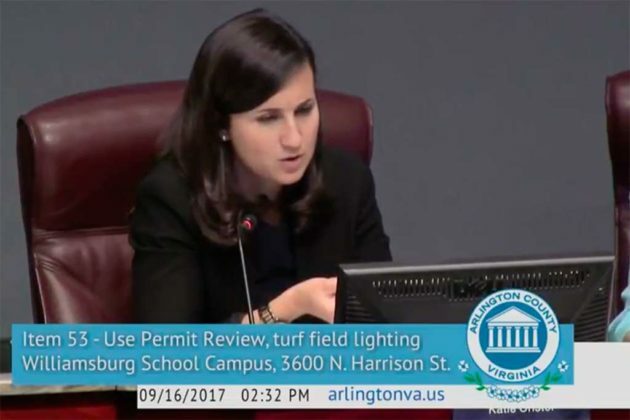 The Arlington County Board pushed back a decision on lighting athletic fields near Williamsburg Middle School, so plans can be studied further by county staff. 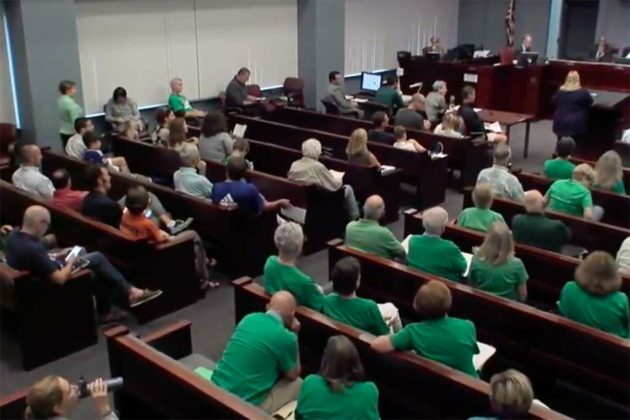 The Board’s unanimous 5-0 vote came after almost six hours of public testimony and discussion by opponents and proponents of the lights, with many opponents wearing matching green shirts. It means any decision on lights will be delayed to next year. Instead of following staff’s initial recommendation to fund lighting the fields, Board members voted for County Manager Mark Schwartz to further study ways to increase the county’s stock of athletic fields, including through the use of synthetic turf and lights. 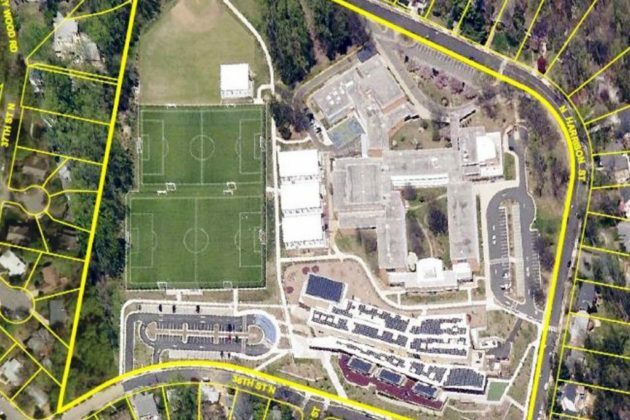 The study will include drawing on a section of the Williamsburg Field Working Group Final Report that concerns how to evaluate potential field lighting. 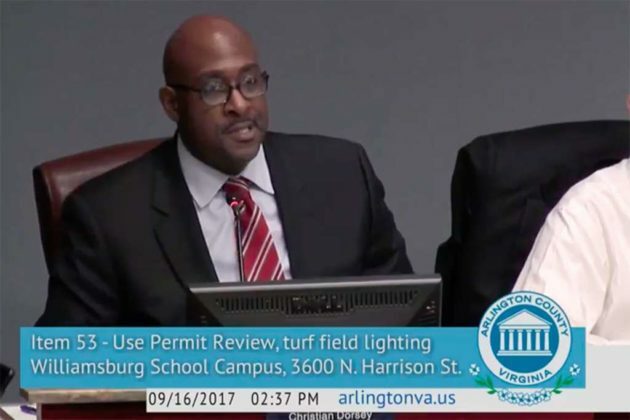 Schwartz announced in June he is recommending lights for the fields near Williamsburg Middle School and Discovery Elementary School in Rock Spring. He recommended that the two fields be lit with shielded LED lights that could be dimmed during evening play, and that lights be left on no later than 9:45 p.m. He suggested 84 lights installed on six 80-foot poles. Board vice chair Katie Cristol said further study should take into account field usage and impacts on neighborhoods (referred to as “externalities”), as well as the usage of fields by those who live nearby. But the moods of some Board members began to fray towards the end of the discussion. John Vihstadt tried to add language to avoid what he described as the “singling out” of Williamsburg Middle School and give the study a broader context. But Cristol and others objected. The Board also directed Schwartz to study amending the county’s Zoning Ordinance to allow lights above the current maximum height of 68 feet, thus not requiring a special approval process. Board member Christian Dorsey expressed some reservations about directing “a study that already determines an outcome,” but the study will proceed. “The whole idea that we would direct at the moment that we’re going to have a study with an outcome really doesn’t give it a whole lot of credence,” he said. Divisions on the topic were apparent in both public testimony and the slew of letters about the project submitted by county commissions both in support and against. Opponents say lights are incompatible with the residential neighborhood, would create more traffic and light pollution while damaging wildlife and trees. Dorsey said it was not so simple as to term opponents as “NIMBY” neighbors and supporters as youth sports advocates. He noted that there are no “neat boxes” on an issue like this. “I think it would be a mistake to go away from this process thinking only that the people who oppose lights are NIMBYs, and the people who favor lights don’t care about neighborhoods,” Dorsey said. Board chair Jay Fisette and colleague Libby Garvey expressed a willingness to vote for lighting the fields, citing the work at Wakefield High School to mitigate the lights shining on nearby houses as proof the technology has evolved. Fisette noted “disappointment in the room” from all: opponents who wanted the lights plan nixed altogether and proponents who wanted them approved that day. The direction for further study means any decision will not be made until next year.